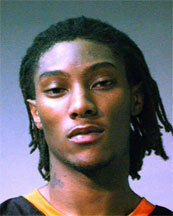 The Chris Henry who is 24 years old Has been arrested again. Chris Henry has been arrested 4 times in the last 14 months. Is he a criminal? Chris was also suspended for half of last season by the NFL. This entry was posted on Thursday, April 3rd, 2008 at 12:46 pm	and is filed under Amazing, Interesting, People, sport. You can follow any responses to this entry through the RSS 2.0 feed. You can leave a response, or trackback from your own site.